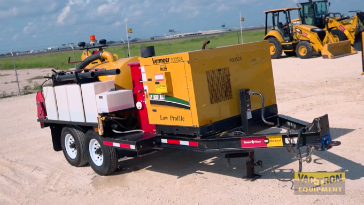 Texas First was challenged to find the perfect vacuum excavator and industrial vacuum equipment to add to the rental fleet. "The most important factors in determining what fleet we bought was the relationship we have with our dealer support network and the fact that we can utilize one model and maintain a commonality of parts." said Colin Martin, District Manager of Texas First. Vac-Tron Equipment vacuum excavators and industrial vacs were the solution. "We started buying the Vac-Tron machine when we initially started the company back in 2015. It's a product that appears across all our stores, we have about 15 stores across the state of Texas," said Martin. Michael Rutledge, Outside Sales Rep added, "The best advantage for us to be carrying Vac-Tron is our competitors don't, so we have the upper edge. So, for an outside sales rep, its an absolute gold winner. The hydro vac makes it simpler and safer to use than the conventional excavator." In the end, both customers and company owners were satisfied. "I hear probably weekly that our customers are very satisfied with the product. At this current location, there are three customers that currently use these Vac-Tron's monthly, some even use them long term on a 3-6-month basis" says Rutledge. "I would recommend these machines to others just for the ease of use, ease of maintenance, service ability concerns, and the return on investment," says Martin. "The rental return on investment (ROI) is how we are opening our doors everyday and closing them at the end of the day. I think this product is really making that bottom line more effective," added Rutledge.